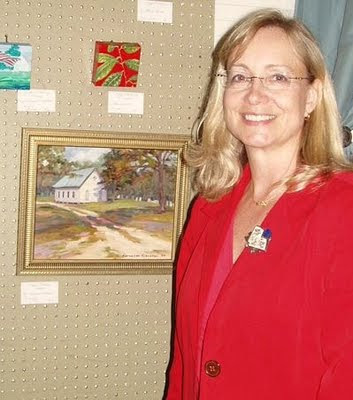 Dean, Olivia, and I plan on painting at Bicentennial Park in Swansboro Sunday, November 1st ... if anyone wants to join us come on down. 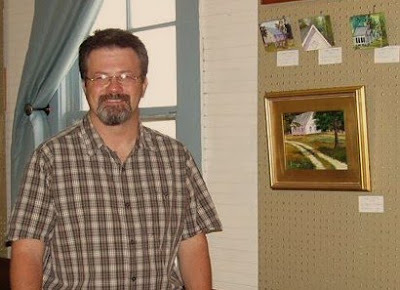 November marks Dean's two year anniversary of painting and he wants to paint the same scene he did for his first plein air painting. Cool idea Dean! Dean plans to be there around 10am and Olivia and I will join him after church. 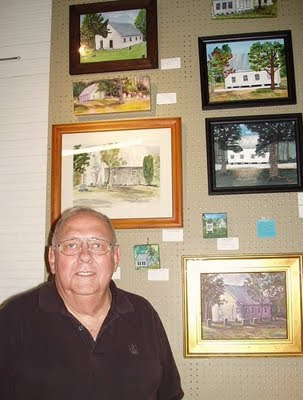 Music including Classic Collection and the Hominy Swamp Gut Bucket Band; Fossil Hunting; Children’s Discovery Exhibit; Classic Auto Show, and Tractor Show; Special Fire Safety Demonstrations from the Richlands Volunteer Fire Department; and much more. This will be our monthly paint out. I am still waiting of confirmation of a great spot by the land owner. It's a area in the Pumpkin Center area with beautiful oaks towering over a pond... the colors should be awesome. I'll let you all know asap when confirmed. If this falls through we will paint at the Northeast Creek Boat Access... more pretty trees and water. Again... I'll keep you posted about the location but the date and times are set. PS... remember to set you clocks back one hour this Sunday night at 2AM. 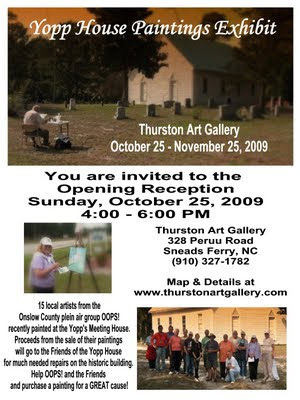 Thurston Art Gallery is a quaint building with some history itself... orininally an old church built in 1939. 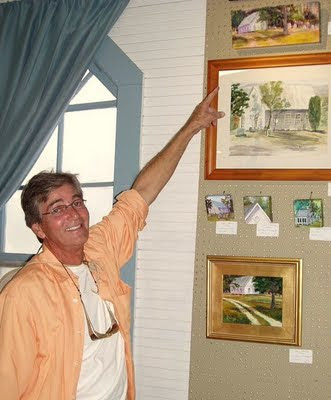 15 Onslow County artists from the plein air painting group OOPS (Onslow Outdoor Painters Society) gathered to paint the historical Yopp's Meeting House est in 1813 as a fundraiser. 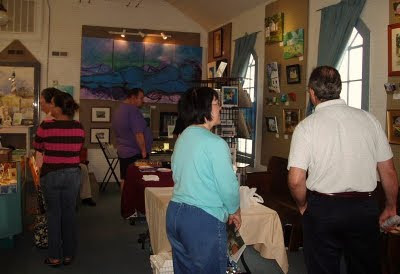 Several of those 15 artists attended the opening reception for the exhibit last Sunday, October 25th. 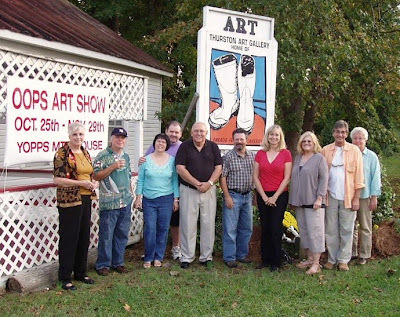 Pictured LtoR: Pat Boni, Steve Lambert, Donna Tyree, Earl Tyree, Tom McKenny, Bernie Rosage Jr., Karen Crenshaw, Sherry Thurston (artist and owner of Thurston Art Gallery), Mitchell and Penny Morton. Not pictured: Kassiane Patselas, Dean Remington, Stephen Greer Sr., Patrick Raynor, and Patsy Lain. 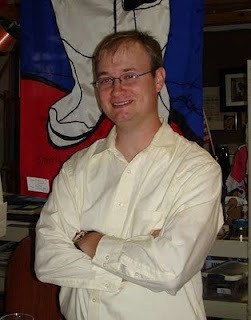 A special thanks to Sherry's son Josh, who did a GREAT job diplaying the paintings. for much needed repairs on the historic building. Please share this image/invitation with all your friends and patrons. See you all Sunday afternoon! 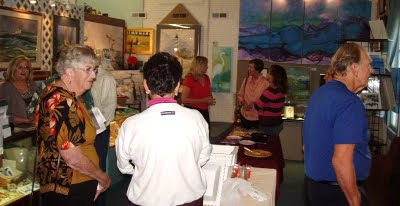 Surf City Paint Out in the Park CANCELLED this weekend! 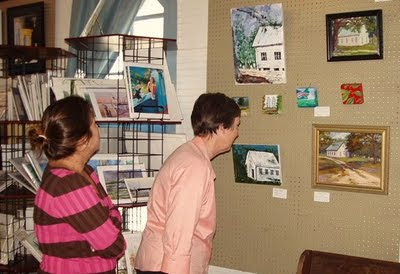 The Surf City Art Guild just informed us that the Paint Out in the Park scheduled for October 24 - 25th in Surf City has been CANCELLED due lack of artists attending. 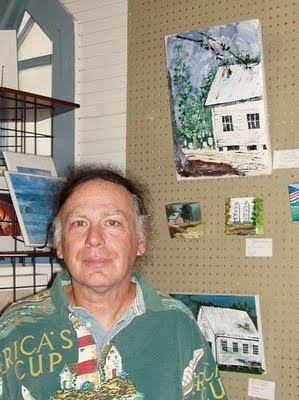 Opening Reception at Thurston Gallery for Yopp House paintings set for October 25th from 4-6 PM. OOPS members note... 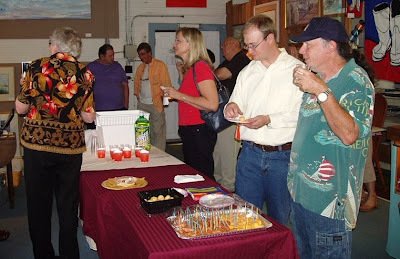 Remember to bring your friends and a finger food side dish... see ya there! FOR IMMEDIATE NEWS RELEASE: OOPS did their part NOW it's YOUR turn! 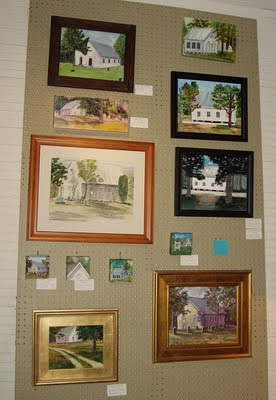 OOPS members recently did a paint out at the historical Yopp's Meeting House in Snead's Ferry, NC. 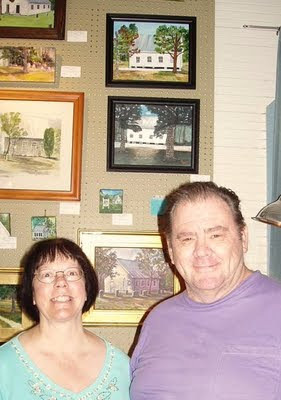 The OOPS artists have agreed to donate proceeds from their painting from the event to help the Friends of the Yopp House raise money for repairs needed on the historic structure. 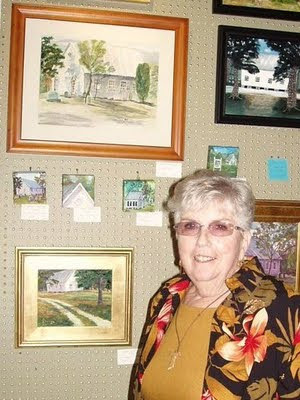 The Daily News had a great article about the house and event here... Group lends hand — and art — to help preserve historical landmark. 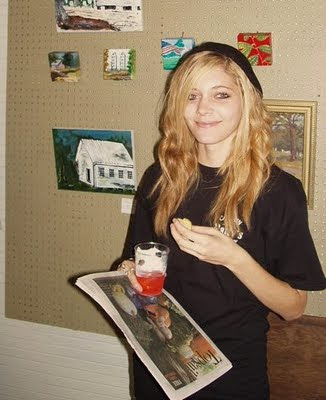 OOPS members painting at the Yopp House... Doing their Part! The interior showing damage needing repairs. 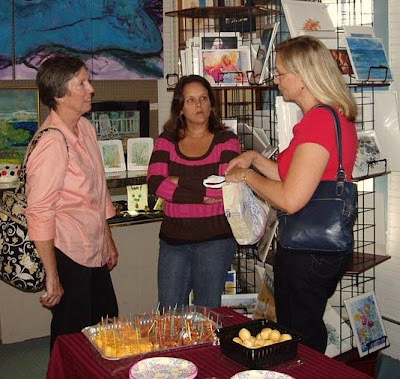 Artist/teacher/gallery owner, Sherry Thurston (pictured left) organized the event and will have the paintings displayed to sell in her gallery through Thanksgiving. 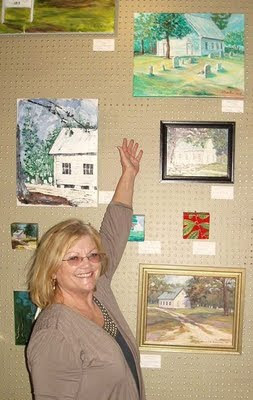 This is where YOU come in and do YOUR part... join her and OOPS artists at the opening reception on Sunday, October 25th from 4-6 PM and BUY these works for a GREAT CAUSE! 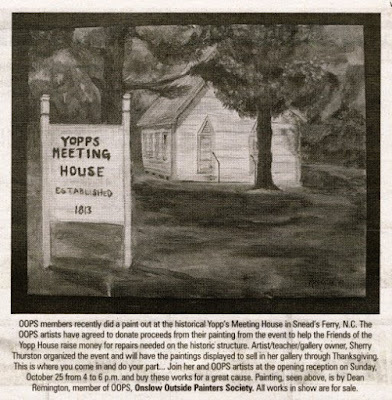 Yesterday's paint out at the Yopp Meeting House was special in many ways... great weather, great turn out and fellowship, great food, and a great cause.